How Much Faster Is The iPhone 4? Before Ordering An iPhone 4S"
Before you order your iPhone 4S to replace your iPhone 4, I want to offer you a preliminary performance perspective. 1. 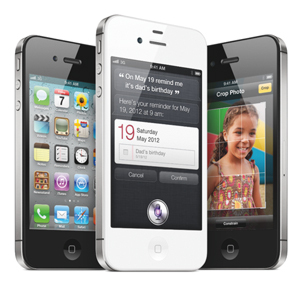 The iPhone 4S CPU is two times faster than the iPhone 4, according to Apple. That sounds believable since the iPad 2 (with the Dual-core A5 chip used in the iPhone 4S) runs Geekbench and Sunspider benchmarks two times faster than the iPhone 4. 2. The iPhone 4S GPU is seven times faster than the iPhone 4, according to Apple. I don't know about "seven times" but the iPad 2 runs OpenGL Extensions Viewer three times faster and GLBenchmark 2.1's "Egypt High" five times faster than the iPhone 4. 3. The iPhone 4S camera is faster. According to Apple, you can open the Camera app right from the Lock screen and it's ready to take a photo within one second. It's ready to take the second photo in a half second, thanks to the power of the Dual-core A5 chip. And, of course, it's a better camera than the iPhone 4 has in several ways. 4. The iPhone 4S maximum theoretical download speed has doubled (from 7.2Mb/s to 14.4MB/s). However, actual download speed will depend on the service provider you choose. At certain locations in our city, we have seen as high as 6Mb/s downloads with our AT&T iPhone 4. More often we see speeds under 3Mb/s. Unless AT&T upgrades their data network, the iPhone 4S won't download any faster. The only way you will see anything close to 14.4Mb/s downloads in the U.S. is when the LTE iPhone is released. Our Verizon LTE portable hotspot has been measured as high as 20Mb/s. We use it with our "WiFi only" iPad 2s, MacBook Airs, and iPhone 4s. 5. The iPhone 4S optional flash storage has doubled from 32G to 64G. It now matches the iPad 2 in maximum capacity. However, unless you are storing a bunch of full length movies on your iPhone, you may not need the full 64G. My 32G iPhone 4 contains a 758 songs, 88 videos, 2 short movies, 835 photos, and 186 apps. I still have 10.9G left. I have those items plus 9 full length movies on my 64G iPad 2. It has 15.5G to spare. 6. The battery life of the iPhone 4S is essentially the same as the iPhone 4 even though it has a more powerful CPU and GPU. If you want to sell your old iPhone, check out the offers at Gazelle.com. PC Mag is put together a comparison of the AT&T USA, Sprint USA, and Verizon USA voice and data plans.